What is your biggest leak test challenge? Leak testing is often an art as much as it is a science. Manufacturing quality engineers and machine operators must contend with many external factors that can undermine accuracy and repeatability. On today’s factory floor, digital process signature (or waveform) analysis, coupled with powerful applications for big data analysis and visualization, can be used to eliminate much of the uncertainty and guesswork that plagued leak testing in the past. Fill out the form to download the e-book now. The waveform, or digital process signature, of a manufacturing process or test cycle displays like an electrocardiogram (ECG). Like a heart, a healthy one always has the same signature. It’s easy to visualize and spot minor or even subtle variations in the slopes of the waveform that indicate an issue. By collecting the signature from every test cycle into a central database, you now have an archive, traceable by serial number, that can be used to drive the reliability and repeatability of your leak test. 5 things to check to get the setup right: Even the best digital technology to make a leak test smarter won’t help if the test station suffers from mechanical issues. 4 details to address to ensure repeatability: Tackle the culprits responsible when a leak test must be run a second time to get a pass, or results differ between repeated tests. 6 tips to shorten cycle time: Use manufacturing analytics to focus, refine and chart the impact of the changes made by your team to make your leak test faster. 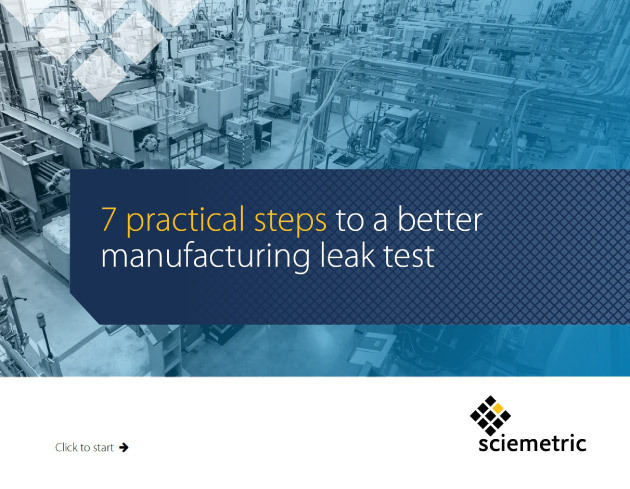 Fill out the form to access our free e-book and find out 4 more things you can do today to improve your leak test.